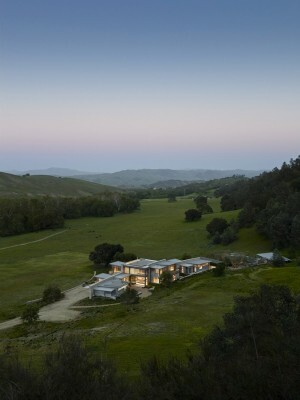 Nestled amidst the grazing livestock of a thriving walnut farm in California’s Central Valley, this family retreat strikes a balance between privacy and openness. 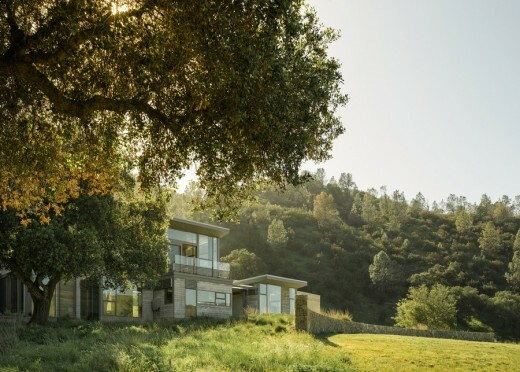 It pairs a bunkroom and two private guest suites connected by a catwalk with expansive communal living and cooking areas, which open eastward towards views of rolling ridges along the San Andreas Fault. 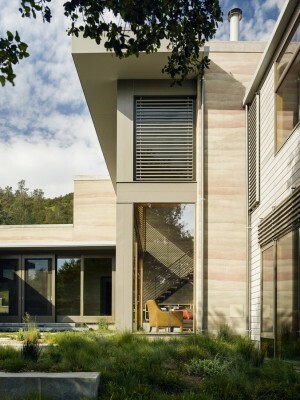 Three long, gently arcing rammed earth walls anchor both the indoor and outdoor spaces of the home to their site, hugging the contours of the landscape. 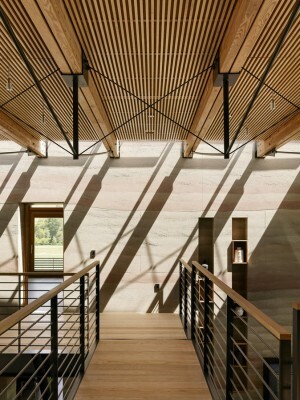 Throughout the home, a palette of wood, glass, steel, and stone compliments the bold texture of the rammed earth. The design achieves LEED Gold performance through drought-tolerant landscape design, attention to water efficiency, passive solar heating and cooling, alternative energy, and sustainably-harvested materials. The site features non-invasive plants and deliberately compact development that leaves the majority of the site undisturbed. 98% of the site is permeable, and the run-off from the remaining impermeable surfaces is directed to on-site retention areas. By committing to the use of native, drought-tolerant landscaping, the design team reduced the site’s irrigation demand by 70%, and they used low flow bathroom toilets heighten the home’s water efficiency even further. 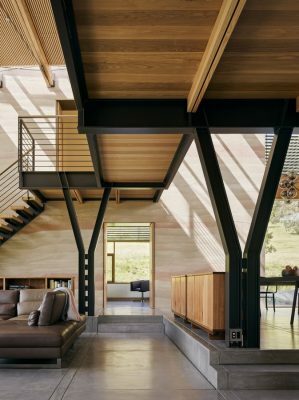 The house’s exposed concrete floors and rammed earth walls form a thermal mass that absorbs heat from daytime sun and releases it slowly during cool nights. 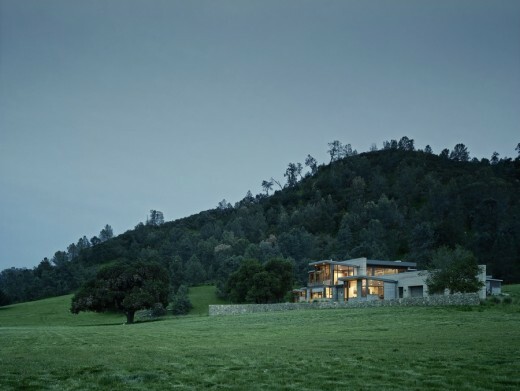 The glazing’s .3 U-factor and .27 Solar Heat Gain Coefficient (SHGG) maximizes Spring Ranch’s passive solar gain while simultaneously minimizing harmful UV Rays. Extensive cross ventilation and ceiling fans, combined with shading slats at tall windows susceptible to direct sun exposure that reduce the load on active cooling mechanisms, keep the home cool on hot days. The site’s deciduous trees and a planted shade trellis at the south end of the house reduce solar heat gain during the summer and encourage it in the winter. An insulated, recirculating hot water system and blown-in, bio-based insulation that minimizes air leakage reveal the level of detail of the home’s passive solar heating and cooling system. Combined, these efforts allow the home to exceed Title-24 requirements by 49% and to earn an EnergyStar rating for thermal bypass system. In addition, the home’s integrated photovoltaic panel system produces 62% of its annual energy requirements, and the design includes a solar thermal array used for water heating. A geothermal ground source heat pump draws warmth from the earth to heat the hydronic radiant floor during the cold winter months and, conversely, acts as a heat sink to cool the floors during the summer. With energy efficient appliances and lighting, the homes active systems are highly efficient with minimal environmental impact. The construction process, too, was environmentally conscious. The materials used for the home’s wall framing, cabinetry and interior trim were sustainably harvested (FSC certified). The rammed earth walls were formed with 533 tons of local soil, making up 76% of the total earth used. The Western Red Cedar siding was made from reclaimed wood, there was a 25% Fly ash content in the structural footings and slab, and the countertops were made from recycled composite quartzite. Combine with efficient framing techniques, these locally sourced and/or recycled content the waste generation of a typical construction process by 91%.